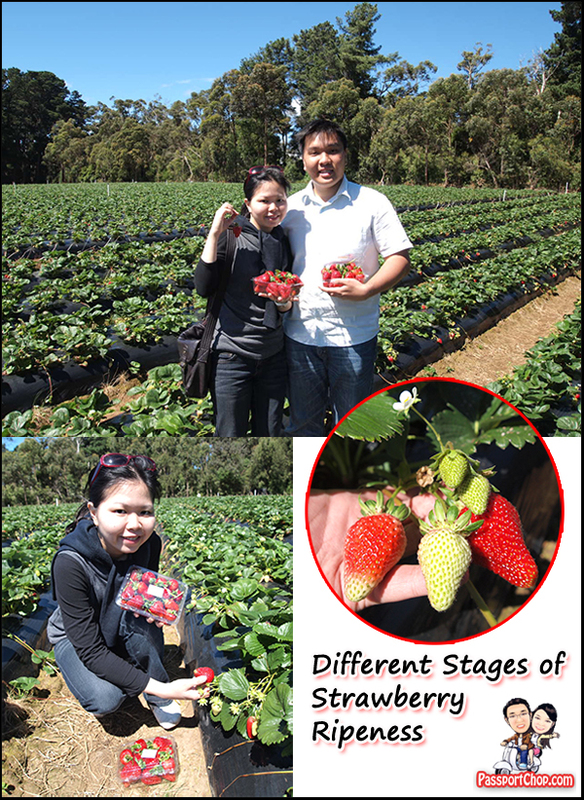 After getting lost in mazes and labyrinths at Ashcombe, we concluded our Mornington Peninsula tour with the most popular tourist activity in this area – Strawberry Picking! Located just a 3-minute drive away from Ashcombe Maze and Lavender Gardens, the Sunny Ridge Strawberry Farm was where we participated in its U-pick programme. If you are planning a trip down to Mornington Peninsula to do some strawberry picking, do note that the strawberry season is from November to April. Off-season strawberry picking is only available at a handful of farms and typically limited to weekends with shorter opening hours. Even in-season strawberry picking is limited at times e.g. Sunny Ridge Strawberry Farm U-pick was closed when we reached the farm at 4pm. The best option for hopeful strawberry pickers would be to join tours e.g. Bunyip Tours which work closely with the farm such that their groups are guaranteed to pick strawberries even if U-pick is closed. As U-pick was closed for that day, our Bunyip tour group got exclusive use of the strawberry fields for picking! Don’t just search in the first few rows. There is a good chance that this is where everyone else has picked. Unlike many fruits, Strawberries will not change in colour or flavour once they are picked. So pick them the same colour as you would like to eat them. 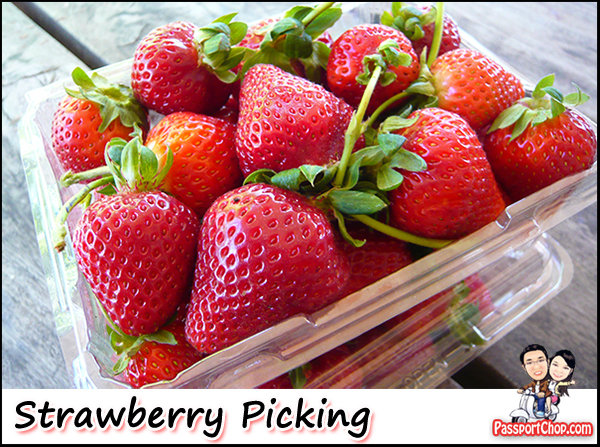 Pick strawberries that are completely red – there are lots around the fields. Don’t try to squeeze too many strawberries into the container as this will “bruise” and spoil them (you will see darkened spots on the parts which had been packed too tightly). 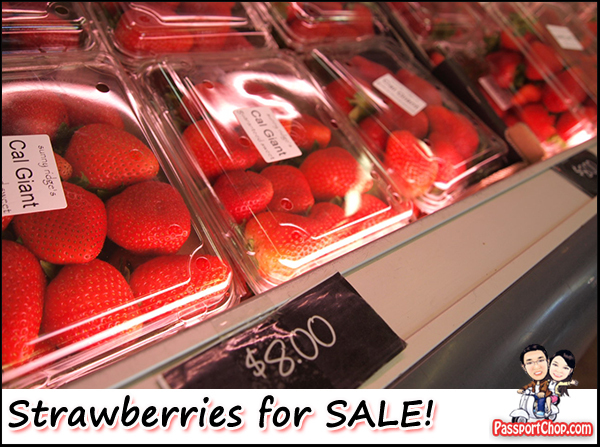 There are a lot of strawberries in the fields so be very selective in what you pick as your picking punnet has a very limited capacity. Leave green strawberries or those that are partially green in the field (anyway they won’t taste good). The sizes of these strawberries are just amazing – as seen in this picture on PassportChop.com Facebook page comparing the smallest and biggest strawberries we picked. The best part is that these strawberries are very fresh and sweet – some of the best strawberries we have ever eaten around the world, even in Singapore! This explains why this is one of the top tourist attractions in the area. If you like anything and everything to do with strawberries from Strawberry Shortcake cartoon characters right down to Strawberry gourmet of all kinds e.g. freeze dried strawberries and syrup – the Sunny Ridge Strawberry shop will be the perfect stop for you after your strawberry-picking session at the fields. We saw just about everything here either being a solid or liquid form of a strawberry or merchandise e.g. socks and shirts stamped full of strawberries! 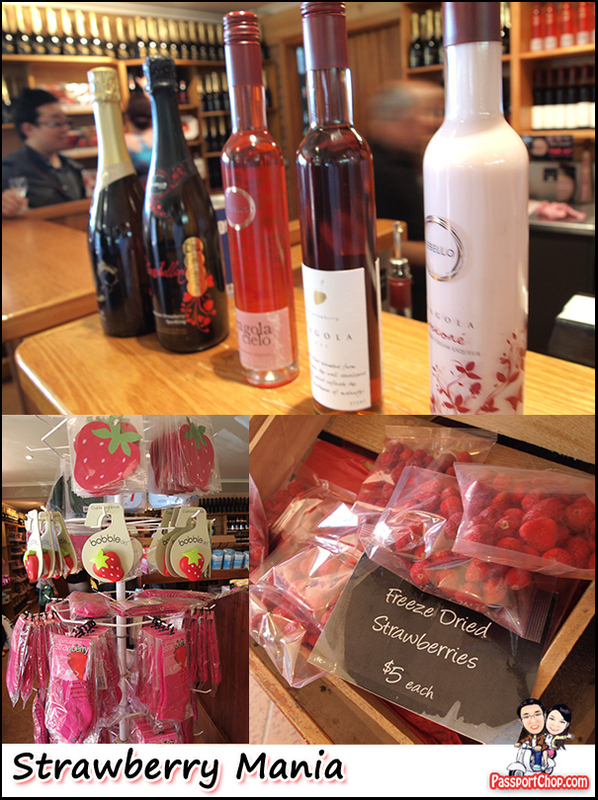 They even have strawberry wines! These Rebello strawberry wines were developed after the owners Matthew and Ruth Gallace branched out from the family business – Sunny Ridge Strawberry Farm. 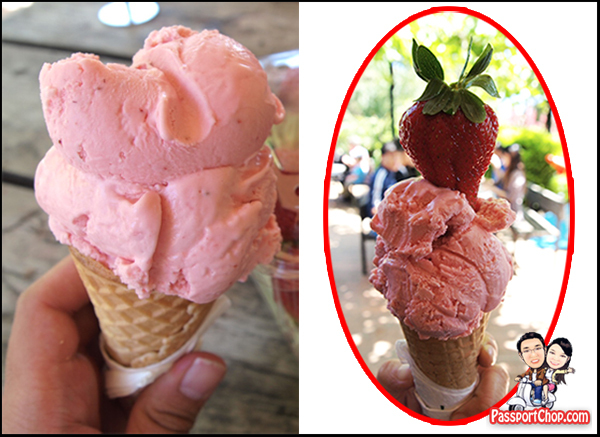 Another reason why people flock to Sunny Ridge Strawberry Farm is its famous Strawberry Temptation Sundae (AUD$12). This sundae is termed as the ultimate Sunny Ridge indulgence as it is spilling with strawberries and Sunny Ridge Farm Made Strawberry Ice-Cream and Sorbet topped with lashings of whipped cream and strawberry syrup. Besides this awesome strawberry treat, there are other strawberry treats on the Sunny Ridge Cafe menu with interesting names e.g. Strawberry Knickerboker Glory, Strawberrt Marshmallow Kebab. However, be prepared to wait from 30 minutes to an hour for your strawberry treats. We opted instead of the simple AUD$2 strawberry ice-cream cone (other flavours available e.g. chocolate, cookies & cream) and topped it with our self-picked strawberry – a perfect sweet ending to our day in the Mornington Peninsula. Don’t worry if you missed the U-pick or you want to avoid the labour of picking your own strawberries, you still get to purchase ready-packed freshly picked strawberries at the Sunny Ridge shop. the strawberries depend a lot on the season.. off season they are hard to chew. Wow Picking strawberries to the farm was one of my plans next week…. I loved to experienced that I should be able to pick them and eat them all I want…..
Hi, I want to know what is the activity in first July,when the u pick is closed? What fruit that we can pick? since its a strawberry farm and its not in season in July, i assume that there will be no picking then. you might want to check with Sunny Ridge on their alternative fruits for picking, if any.